My main goal going into the Lake St. Clair event was to qualify for the Angler of the Year Championship (AOY). That and try to win, of course. Having secured solid finishes in the three previous events really helped — I was now within ten spots of qualifying. I knew it would be difficult, but I liked the odds. My track record on St. Clair is solid, and I’ve cashed checks there pursuing both largemouth and smallmouth. I was ready for either bite. I arrived in Detroit two days ahead of official practice. I wanted some time to unwind from the drive, as well as work on tackle and purchase the necessary permits for Michigan and Canadian waters. My plan was to focus on Lake St. Clair and its connecting rivers — not venture to lakes Huron or Eerie. I made my lure selection accordingly. Included were small swimbaits, jerkbaits, topwaters and a variety of Yamamoto soft-plastics. On day one of practice, I started in Anchor Bay — the northern most part of the lake. While I’ve had considerable success there in the past, things didn’t look right this time. The open water grassbeds were short and overwhelmingly expansive. There was no way to read it, so I moved to the docks to try for largemouth. I found good numbers of green fish on one stretch, but most were two to three pounds … too small for this derby. From there I moved to the St. Clair River where I spent the rest of the day. I located several areas holding quality-sized smallmouths, both deep and shallow. They responded best to a Hildebrandt Drum Roller swimbait and Yamamoto Shad Shape Worm rigged on a drop shot. On day 2, the wind was howling out of the southwest. To compensate, I worked my way along the leeward shore, all the way to the Detroit River. Fishing was slow and almost nothing appealed to me. 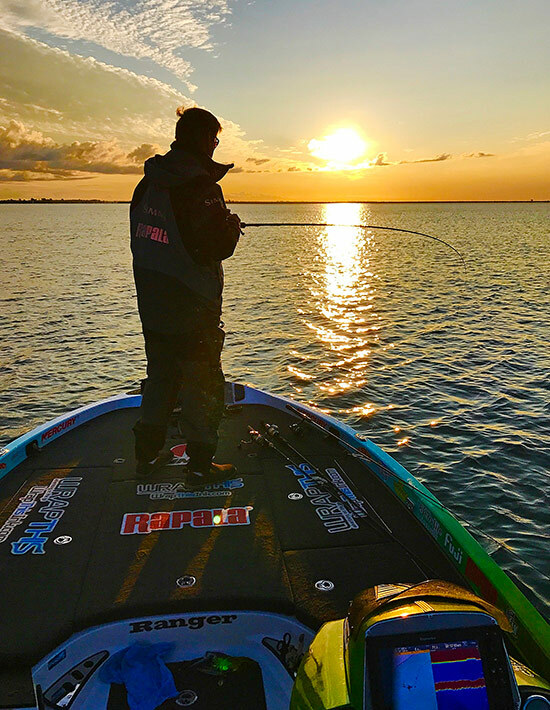 I tried everything, including spinnerbaits and deep-diving crankbaits, with little or no success. Aside from some shallow fish near the mouth of the river, the entire day was a bust. On day 3, I decided to expand on what I found near the mouth of the St. Clair River. It was a good move. Using side imaging, I discovered good numbers of fish and the cover they were relating to. By day’s end, I had doubled the number of promising waypoints on my Raymarine GPS. I was ready for the competition. Because it was the final event, BASS officials released the field in the order of our AOY points standing. That put me at boat 60 in the third flight. The only real plus to that was that I would have longer to fish in the afternoon — a period that seemed more productive in practice. When my number was called, I raced to a shallow flat on the Canadian side of the lake. I started with a Hildebrandt Drum Roller — the same little swimbait that yielded a top-12 finish for me at the St. Lawrence River. Within an hour, I had three nice smallmouth in the box, but then it ended. I tried changing lures, yet, for whatever reason, the area cooled off. From there, I ran upriver to some drop-shot fish. Using a Shad Shape Worm in a perch pattern, I finished my limit and culled to nearly 20 pounds. It was a good start in the event and I couldn’t wait to get them to the scales. Back at weigh-in, however, the truth came out. Nearly everyone had caught big stringers of smallmouth. I was mired in the mid-20s which was a shock. I didn’t expect such a productive catch. I knew, at that point, I’d have to have a repeat performance on day two in order to survive the cut. The next morning I retraced my steps, quickly discovering the fishing was much slower. Sometime around mid-morning I changed to a Rapala Skitter V and put some fish in the box. Two were right at 4 pounds, the rest were much smaller. When that bite waned I moved upriver to the drop-shot fish to cull. By weigh-in time, I had put together another 19-pound bag, easily making the cut. Even better, I was within range of the top-12. I just needed a strong third day to realize my hopes of making it to the AOY Championship. This one choked a Drum Roller swimbait! At the hotel that evening, I had a strange feeling … I should start on a spot I tried in practice. Even though it wasn’t productive then, I felt my timing may have been off. If I hit it just right, big smallmouth would be there waiting. The next morning I raced directly to that spot and, as fate would have it, I began connecting with quality smallmouth, one after another. By 8:30, I had nearly 20 pounds in the box. When I went to cull a sixth fish, I found two in the livewell lying belly up — one dead, the other about to die. I tried applying chemicals and ice, but it was futile. It, too, was gone in minutes. BASS rules state that we are not allowed to cull dead fish. So, not only would I be unable to replace them with larger, healthy fish, I would lose 4 ounces for each … a half pound off my total creel. Throughout the rest of the day, I caught larger fish I was unable to use. It wasn’t until late afternoon that I finally caught one large enough to cull one of the live ones. But even that didn’t help much. Back at the scales, where the full penalty was assessed, my weight fell to 18 pounds, 8 ounces. I had lost ground in the event and moved up only three spots in the AOY standings. The Championship was now out of reach. Looking back, I’m not sure I could have done anything more than I did to ensure a more favorable outcome. It seems like I was teased and taunted. The AOY Championship was within reach, and then it was suddenly snatched away. That’s how it is sometimes. Things can be going your way one minute and totally against you the next. All you can do is try to learn something from the experience.